Resorts in the Colorado Ski Country USA trade association are adding more mountain coaster rides (four) than new chairlifts (one) this summer and fall. It’s another sign that traditional ski resorts are broadening their horizons and looking for additional ways to attract customers throughout the year — and expand revenue. Aspen Skiing Co. is among the resort companies taking the plunge with mountain coasters. It is constructing a mountain coaster at Snowmass. 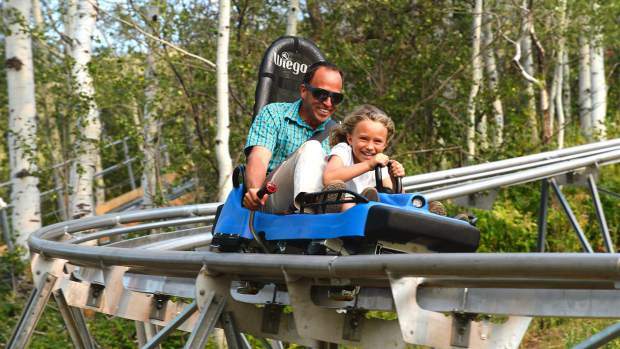 Steamboat Springs opened the Outlaw Mountain Coaster earlier this month. Copper Mountain is putting the finishing touches on the Rocky Mountain Coaster while Purgatory is adding one of the rides, as well. The mountain coasters feature bobsled-like cars that travel on tubular tracks though the forest on a closed-loop system. An electric-power lift hauls cars to the top of the track. Riders have a brake, and an auto-brake keeps the cars under a specified speed. Skico’s addition is called the Breathtaker Mountain Coaster. It is located on Elk Camp, between the Gunner’s View and Sandy Park ski trails. It will provide about 400 feet of vertical drop on a seven- to nine-minute ride. Skico hopes to open the ride in December. Eldora Mountain Resort is the only resort in Colorado Ski Country USA that is adding a chairlift this year. The Alpenglow Express six-person, high-speed, detachable chairlift will reduce a 15-minute ride to four minutes. Arapahoe Basin is adding 371 acres of “most difficult” and “extreme” terrain this summer and plans to add additional terrain and a new chairlift for 2018-19, according to the state trade association. “With one of the only terrain expansions in the country, Arapahoe Basin is adding 468 new acres over two years with the expansion into the Beavers and Steep Gullies,” Colorado Ski Country said. Skiers and snowboarders will have to hike back to the Pallavicini chairlift to access the new terrain this winter. For 2018-19, the ski area will add a four-passenger lift and also add two intermediate trails in the Beavers. Two other interesting changes in operations among members of the trade association are occurring at Crested Butte and Loveland. Crested Butte is launching a new program called CB North Face Guides to help expert skiers and snowboarders navigate the famed extreme terrain of the ski area. Loveland will celebrate 80 years in operation by offering snowcat skiing in Dry Gulch for the first time. Colorado Ski Country USA’s list of improvements for 2017-18 didn’t include projects being undertaken at Vail Resorts’ four ski areas — Vail Mountain, Beaver Creek, Breckenridge and Keystone. Vail Resorts isn’t a member of the state trade association. Keystone is adding the Montezuma Express Lift, a high-speed, six-passenger lift to serve beginner and intermediate terrain. Breckenridge is replacing the four-passenger Falcon SuperChair with a six-seater. It will increase uphill capacity by 25 percent to the steep runs, mogul fields and tree trails on Peak 10. Vail Mountain is replacing chair No. 11 with a high-speed, six-passenger Northwoods Express lift. It will increase capacity by 25 percent and improve the flow of skiers and snowboarders to the Back Bowls and Blue Sky Basin. Beaver Creek is replacing the Drink of Water two-person, fixed-grip chairlift with a high-speed quad chair that will be renamed Red Buffalo Express. The new chair will reduce riding time by 50 percent and increase uphill capacity by 75 percent.